Brooklyn has already had spells with two other Premier League teams, Chelsea and Queens Park Rangers, and played for a Los Angeles Galaxy youth team during his father's time in the MLS. The 14-year-old Brooklyn was accompanied by his father and could return for further sessions. The prospect of the name "Beckham" appearing on the back of a Manchester United shirt has grown closer. 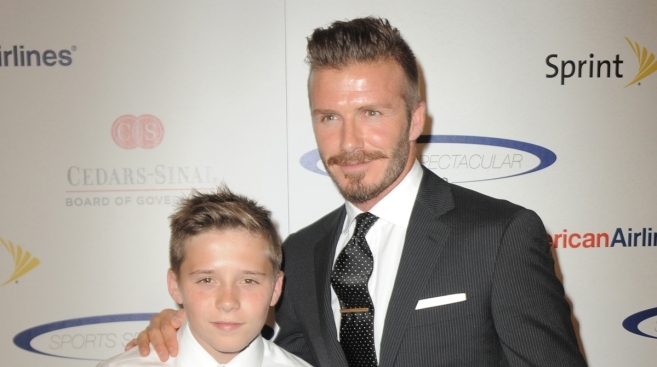 Sections of the British media reported Friday that Brooklyn Beckham, the son of United great David, was invited to a training session at the club on Thursday. The 14-year-old Brooklyn was accompanied by his father and could return for further sessions. United said the club couldn't comment for child protection reasons. David Beckham left United in 2003 after winning six Premier League titles and the Champions League.